Who Wants to Be a Pricing Millionaire??? 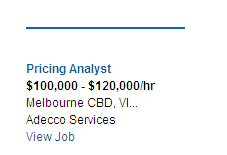 This ad was sent to me by a friend today (22nd November 2012), after he saw a job advertiser on "The Age" website. Nice work work if you can get it!!! At the moment, I’m two-thirds of the way through a pricing roadshow for a large business-to-business company that plays in the industrial market. One of the most frequently asked questions by attendees in these workshops is “How do we know we’re charging the right price?” The latest Richard Gere movie offers an answer. In Arbitrage, Richard Gere plays a businessman who is in the process of selling his company. Eventually, the negotiation leads to a one-on-one meeting with his suitor. Over a meal, they agree a price. Richard Gere takes the restaurant menu, writes down the agreed price and both parties sign the document. Gere gets up to leave and asks “What would you have paid?” The buyer replies with a figure much higher than the one just agreed to. The buyer in turn, asks Gere what price would he have accepted, to which he replies a price figure much lower that that agreed. This insight is of no use to the now concluded, one-off transaction. But for Leading Companies selling products and services day-in day-out, it is a question well worth asking. Just like this scene in Arbitrage, companies have a tendency to over-estimate customers price sensitivity, and under-estimate their willingness to pay. But the question should be asked in every Win-Loss analysis that a company completes: what would you have been prepared to pay? Ask the question enough times, and feed the answers back into your next pitch, quote or contract, and over time Leading Companies will get closer and closer to charging the perfect price.